A discovery that made the world a brighter place! Joe and Bob Switzer were very different brothers. Bob was a studious planner who wanted to grow up to be a doctor. Joe dreamed of making his fortune in show business and loved magic tricks and problem-solving. When an accident left Bob recovering in a darkened basement, the brothers began experimenting with ultraviolet light and fluorescent paints. Together they invented a whole new kind of color, one that glows with an extra-special intensity—Day-Glo. This cover reproduction is not printed with Day-Glo colors. The actual book, however, is printed using three Day-Glo colors: Saturn Yellow, Fire Orange, and Signal Green. 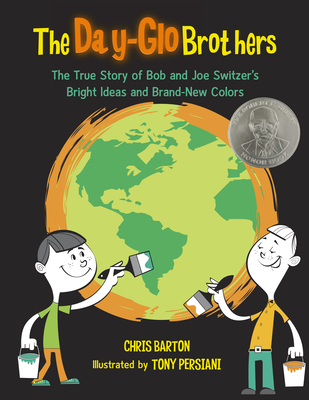 Chris Barton writes about books for children and young adults on his blog "Bartography." He is the author of SHARK VS. TRAIN, CAN I SEE YOUR ID?, and THE DAY-GLO BROTHERS. Chris lives in Austin, Texas.